Tom Mason | Tom Mason and the Blue Buccaneers | Captain's Journal : Dec 28 2009-Jan 25 2010, Virgin Islands Tour!! Dec 28 2009-Jan 25 2010, Virgin Islands Tour!! 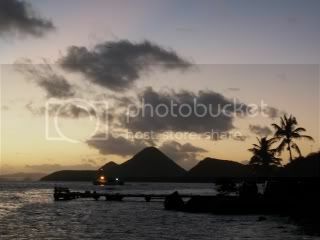 Dec 28, 2009- January 25, 2010 The Monday after Christmas I caught a plane (actually, three) to St Thomas in the Virgin Islands, for a four week tour, two as lead guitarist for Last Train Home and two in a duo with my wife, Pru Clearwater. Eric Brace, drummer Paul Griffith, trumpeter Kevin Cordt, and Eric’s wife Mary Ann Werner met me at the airport. When I arrived, my suitcase was still in San Juan, so we stalled at a restaurant in Frenchtown while waiting for the last plane to come in. The four of them were very relaxed, the consequence of feeling that warm Caribbean breeze after the cruel onslaught of winter. The next three nights we stayed in a great, sprawling stucco and brick inn called Miller Manor. 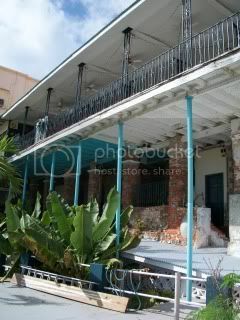 Miller Manor is situated in a bustling West Indian neighborhood of Savan in Charlotte Amalie, and has a number of decks that look out over the harbors of St Thomas, with huge cruise ships that dock in the east, Hassel and Water Islands in the middle, cargo ships in the west, and all manner of boats in between. In addition to guests visiting from all over the world, Miller Manor has a number of faithful permanent residents who all seem to love the proprietors, Marj and Harry, and their assistants, Dean, Val, and Rolando. 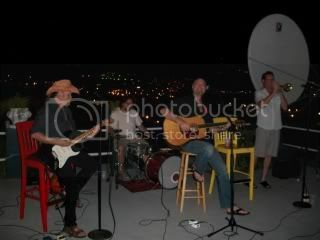 Part of our stay there included a rooftop concert during our second week, and the evening was magical. We performed in the sweet breeze as the sun set over the bay, and local folks and their children, guests, and residents danced. Near the end of the show, we did “Feliz Navidad” and had an impromptu a capella children’s choir singing from the upper balcony. Miller Manor The View from Miller Manor Another view from Miller Manor Eric before the Miller Manor gig The gig at Miller Manor Dancing at Miller Manor Kevin Cordt Pru Clearwater, and Paul Griffith Kevin Cordt is not only a great trumpet player, he’s also one of the funniest people I know. Paul Griffith is not only one of the most recorded drummers in Americana music, he’s also a gas to be around, and kept us entertained with selections from a book about Elvis he was reviewing. Pru arrived on Wednesday, and on Thursday we all took ferries to the British Virgin Island of Tortola, Pru coming on a later ferry after spending the day with our gracious island concierge and friend Edythe Dirks. (I can’t overstate the help Edythe has been to Pru and me, e-mailing us with potential gigs, introducing us to people, putting us up, helping us out in every way!) We arrived at Tortola’s West End, went through customs, and set up to play a three night stand at the Jolly Roger, a favorite club of ours from the past. We saw our old friend Lou, the owner, and a lot of our friends on the staff, who are mostly West Indian. The Jolly Roger is one of the first things you see as you enter Sopers Hole, the bay on the west end of Tortola. We rang in the new year there, and after the gig Pru, Paul, and I caught a ride to the north side of the island and the Bomba Beach Shack, well known for it’s all-night full moon parties. By the time we arrived everything had already mellowed out (though mellowing out seems to be part of the purpose of the full moon party), but it was a beautiful place to start the year. 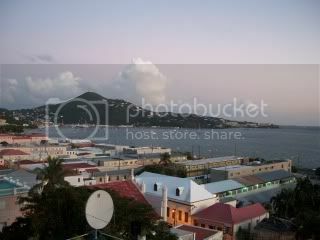 My last sunset of 2009, on the West End of Tortola. Smuggler’s Cove, Tortola. A rough hike to a beautiful beach. On Sunday we returned to St Thomas for a few shows, and Pru and I stayed with our friends Brian and Gail, who spend their winters on St Thomas and summers on Cape Cod. Brian is very funny, and gave me pointers on guitar playing without ever touching one. We shared stories about our times living in Asia, and had breakfast on their porch near the point of Peterborg, while pelicans flew by below us. On Tuesday Last Train Home played an afternoon gig on St Thomas and then piled in the rental car to catch a ferry to St John for an evening gig at Island Blues in Coral Bay. On the way we stopped at the Beach Bar, a great waterfront bar owned by our good friends Allan MacPhee and Cat Braaten MacPhee. In the late eighties and nineties I toured a lot with Cat when I was moving from Minneapolis to Chicago to Nashville, and she was tearing up the college circuit. She moved down here about 10 years ago after gigging down here, and I first came here five years ago with Last Train Home. 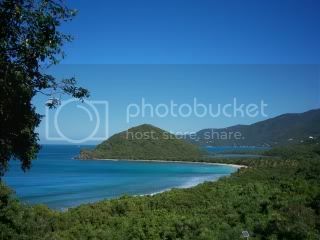 All of the Virgin Islands have their own special charm, and St John is the most picturesque of the U.S. Virgin Islands due to the fact that Lawrence Rockefeller bought the island when it was a sugar plantation and donated it to the National Parks. The north shore is filled with expansive sandy beaches, great for snorkeling and swimming. We usually make at least one trip to Cinnamon Bay, where there is a National Park Campground, a snack shop, and an archeological dig site where you can learn about the history of the area. It’s not uncommon to see wild donkeys roaming through the grounds. Coral Bay is the sleepier side of St John, and is a little less traveled and probably a little less transient and a little more artsy. 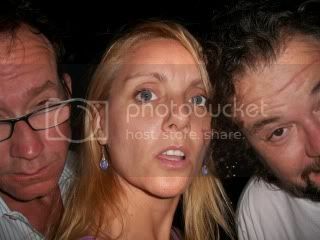 A few years back when Pru nd I played Island Blues with The Big Happy, we had a crazy night, with an older hippie woman blowing her harmonica at me all evening (all in a single key, no matter what the band was playing in), and a man half submerged in the sea, waving a bottle of rum and yelping at Pru and Jill as they tried to sing and play. Last Train Home’s gig was much more civilized, a house full of music lovers. Wednesday we played at the Beach Bar, where we were graced by both Cat and Pru’s vocals. On Friday January 8th we went to the ferry dock on St Thomas at 7 a.m. With Last Train Home to catch the early ferry to St Croix, but they told us there was engine trouble and it wouldn’t be leaving until eleven. We went back to Miller Manor, where LTH had been staying, and had breakfast with Eric’s wife Mary Ann, who was flying back to the states that day, and when we returned the ferry still wasn’t ready to go. By two o’clock we had run out of time and took a taxi to the airport to catch a tiny plane to St Croix. We were met at the airport by our Virgin Islands agent Charlie Campbell, who I knew from his days in Minneapolis where he managed two of the twin cities best bands of the seventies, the hippie funk band Willie (Murphy) and the Bees and the Blues band Lamont Cranston, both of whose members appear on Bonnie Raitt’s first record. We high-tailed it to an outside dinner club on Eastern St Croix called Cheeseburgers in Paradise. St Croix is the funkiest of the islands, partially due to its proximity. It lies a good deal south of the St Thomas and St John, so there are fewer tourists, and we end up playing for locals and seasonal residents. This year we stayed in the beautifully dilapidated city of Frederiksted, filled with Danish ruins as well as fixed up buildings with thick stone walls and arches. 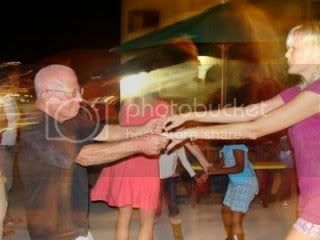 At night you can walk down the streets and hear a wild mix of calypso, reggae, Mexican polkas, and Afro-cuban rhythms. Christiansted, the city on the north shore, is busier and a bit bigger, but this year we didn’t get over there. 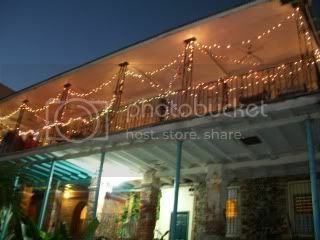 In St Croix we stayed at a great place called Jasmine Manor in Frederiksted, a wonderful inn consisting of three buildings a beautiful yard tiered by ancient stone walls, and a few amazing 200 year-old trees. The baobab tree next to the house where Pru and I slept is huge and thick. Legend has it that african slaves hid the seeds of the sacred baobab trees over in their mouths during their passage, and that’s how they came to grow here. It is awe-inspiring to be in the presence of such a plant. On Saturday we played at Chicken Charlie’s and saw a couple of old friends from St Croix, Michael Justis and Will Hart. I’d met Michael three years ago with the Big Happy, and at the time he was walking with a cane and about to undergo treatment for cancer. This time he looked about a foot taller and in great shape having kicked the big C. When we played there again on Monday they both sat in, Michael singing and playing and Will on pedal steel. On Sunday afternoon we played one of my favorite gigs in the universe, the 3:30- 7 shift at Rhythm at Rainbow Beach on the west end of the island. We swim during our breaks and our last set occurs while the sun drops into the sea. Such a buzz. The first few times we were there, the rastafarian bar-back Rass Boof sat in with us, singing “No Woman No Cry” with the greatest presence. (I filmed him singing it with The Big Happy, and I’ll try to post it on youtube when I get back to Tennessee.) The third year I was there we learned that Ras had died of cancer, so this time we dedicated “I thought I Heard a Train” to him. A few days later an old friend of his named Chico brought me a button with Ras Boof’s photo on it. Tuesday January 12th was Last Train Home’s final Island gig, a private party at Jasmine Manor, and it couldn’t have been a nicer night for it. Charlie cooked Chicken and ribs, Diana tended bar, and 50 Cruzans sat at tables on the lawn while we played in the beautiful, ancient villa. The next morning Pru and I caught a sea plane to St Thomas and a ferry to St John and checked in to the Inn at Tamarind Court, our home for the next three nights. Our rooms had great bamboo furniture straight out of Gilligan’s Island. The Inn is a cool, unpretentious hotel owned by the family of our Nashville friend John Condon, who runs King Easy records and has managed cool people like Darrell Scott. We played an early evening gig there, and then walked down to the Beach Bar to catch a set by Cat, T-Bird, and Wanda, and even sit in for a few tunes. On Thursday, after a rough day at Cinnamon Bay, we rehearsed a bit and headed over to do our duo gig at the Beach Bar. We had a great gig, due in part to a guest performance on the beach by our friends The Pyros of the Caribbean, fire breathers, twirlers, jugglers. It was an amazing site, right in the middle of our set. Having never engaged in this kind of thing before, we weren’t sure what to play, and I set off on a medley of fire songs before breaking into our pirate repertoire, much more appropriate. The performers were Fuego, Sandwich, and Chris, and I think from now on my piratical jig “Queen of the Spanish Main” will be dedicated to Sandwich. On Friday we braved the rain to hitchhike across the island to Waterlemon Cay, a nesting ground for turtles. Hitchhiking is a great way to go on St John, and we got rides from Bali Bob (a local who deals in artifacts from Indonesia) a family from Maryland, a Jazz pianist visiting from NYC, and a lovely St John-ian who was listening to Opera on her way from work. We played at Tamarind Court again, and followed it with a quiet night. On Saturday we left early for Coral Bay and visited Sushi, the sailboat where Fuego and Sandwich live. The sky was just clearing, and as we got off the dinghy a spotted ray swam beneath us, and then Pru dove in for some pre-show snorkeling, flirting a bit with a rare leather-back turtle. That night we were joined on djembe by one of Fuego and Sandwiches’ sailboat neighbors, Kenny, and had a great groove all night long. On Sunday Edythe’s bass playing husband Paul Dirks picked us up from the St Thomas ferry in the pouring rain, and we got ready for our show at Tickles Dockside Pub at the Crown Bay Marina. The show was a gas, with a bunch of our new friends there and a crowd peppered with old salts. Among our new friends were Duane and Laura Hausch, who run Admiralty Dive Center, subtitled “The Last Buccaneer”. Paul and Edythe had them over before the gig, and in addition to being a dive instructor, a captain, and a singer songwriter, Duane is quite an expert on pirates, so we had a lot to talk about. (He’s also been an engineer and an actor.) The next day Pru went out on an Admiralty dive with Duane and Johnny who lives with singer Becca Darling in Edythe and Paul’s apartment. Pru had a great time, diving around a wreck off St Thomas, and raved about Duane and Johnny’s expertise. After a few nights off, we played another outdoor gig at the club Wikked at Yacht Haven Grand, a short walk from where the cruise ships dock. It was another beautiful night, sweet breeze off the harbor, friends gathered while we played. Our new friend Jennie Alverez was there with her drummer boyfriend Robert Falzarano and friend Kelli. Jennie is starting to promote music in the islands, and booked the gig at Wikked, as well as finding a venue at the Antilles School for Pru to do her Infinite Field performance the following night. In Nashville her Infinite Field performances have consisted of a large cast of musicians, poets, a lighting person (Rich Davis) and a dancer (Gabriella Sabila), and in St Thomas she did a scaled down version, with just me playing to tracks, but she managed to transform the school classroom into a beautiful shrine with lights and fabrics borrowed from Edythe, a p.a. borrowed from Robert and Peter, and a poet named Jo-el came from St John with his friend Jess, and recited some great poems. The people who were there loved it, and there was some talk of trying to do another Infinite Field show on the beach, but our time on the islands was running out and we needed what little time we had. On Friday we took a ferry to St John to spend some time with Cat and Allan and play our final gig Saturday night at Shipwreck Landing. This time Shipwreck’s owner Dennis played bass with us with us, and we had a flurry of guests, including Jo-el, a flutist, a belly dancer, and all our pyro-pirate friends. On Sunday morning we walked to Soloman beach on the northwest end of St John for one last dip, and then we caught a ferry and returned to Edythe and Paul’s, and after the three of us had a nice beach-side dinner with Jennie, Kelli, and Robert, we went to pack for home.